"After two years of experience, your agency heads should be asked to identify those policies that are either not working, or unnecessary," says the Dec. 31 letter signed by 26 of the 51 Council members. The effort was spearheaded by Council Member Dan Garodnick and, significantly, includes the signature of finance committee chair Julissa Ferreras-Copeland. The signature of Council Member Steve Matteo, minority leader of the Council's Republican caucus, was accidentally omitted from the letter, his office told Gotham Gazette. The letter, first reported by the Wall Street Journal, calls on the mayor to instruct his agency heads to find five percent in potential savings across the board in what would be a return to a cost-saving practice performed by his predecessors that de Blasio has moved away from. Though the letter does not explicitly say so, the Council members are referring to a PEG or Program to Eliminate the Gap, which was used by prior administrations to identify ways of reducing expenses, eliminating waste, and boosting revenue to close projected gaps in the budget. It is called a good government practice by officials and budget watchdogs, some of whom have raised eyebrows as the city budget has grown rapidly over the past two years. Mayor de Blasio did away with PEGs once he took office and instead launched a Citywide Savings Program in his May 2015 executive budget. The CSP relies on recommendations from city agencies, without a hard requirement. Some have called PEGs too ruthless, noting that in certain cases an agency may be ripe for finding reductions while another agency actually needs more funding. "Budget monitors and rating agencies have all applauded this administration's fiscal prudence, with reserves at unprecedented highs, out-year gaps at lows, and a strong $1.1 billion citywide savings program for FY15-16 that we'll build on this year in collaboration with the Council," said Amy Spitalnick, spokesperson for the Mayor's Office of Management and Budget, in a statement to Gotham Gazette. Spitalnick added that the administration has also secured "billions in unprecedented health savings" through the union contracts it negotiated. Those new labor deals - signed by de Blasio after he came into office with no municipal unions under contract - are part of the reason the city budget has grown under de Blasio. The city budget for the current 2016 fiscal year is over $80 billion, though city reserves are at unprecendented level, in part due to a booming city economy. Spitalnick also told Gotham Gazette what she had told the Wall Street Journal, that "The city has prudently used revenue that came in above estimates to pay down future years' gaps and boost reserves." City Council Member Helen Rosenthal, who chairs the contracts committee and signed the letter, seemed to scoff at this suggestion, writing on Twitter, "Admin response to "boost reserves" misses the point. There are always savings." Spitalnick told Gotham Gazette in response, "We have a robust savings program in place AND we have simultaneously boosted reserves to unprecedented levels to protect the City in the event of a downturn. Seems like lots of folks are confused here." A large part of the administration's argument against PEGs is that they would lead to billions of dollars in cuts to services and staffing, including tens of thousands of layoffs. Estimates from the mayor's office say they would have to eliminate up to 45,000 positions -- including more than 10,000 teachers and 5,700 police officers -- and cut daily Fire Department emergency medical services by seven percent. It would also force a reduction in implementing Paid Sick Leave by costing the Department of Consumer Affairs dozens of staff. Council Member Dan Garodnick pointed out that what the letter asks for is more of an advisory figure than a mandatory one. "That does not mean that we necessarily want to cut the budget by any particular amount," he said. "We just want to assess our priorities," he added, alluding to the exercise of finding "potential savings," as the letter requests. Garodnick said the Citywide Savings program definitely helps, but agencies should undertake a more formal and complete review. "The agency heads are in the best position to identify what's working and what's not. We need to tap into that expertise to be able to do sound budgeting," he said. The City Council itself has been party to the city's spending increases, of course. Aside from agreeing to the overall budget with the mayor, the funds directly spent by the Council has gone from $51.5 million in FY 2014 to $61 million for FY 2016 -- an 18.4 percent increase. Council members are also preparing to vote for salary increases for themselves and other city elected officials. Last year, the Council was successful in its push for adding 1,300 more officers to the police force, adding around $100 million to the city budget. Just last month, the Council, with an overwhelming majority and in partnership with the Mayor, passed a controversial bill that would use public funds to pay for security guards at private and religious schools. In the debate over the bill, its lead sponsor, Council Member David Greenfield, said the $19 million price tag was affordable since the city is "flush with cash." Greenfield did not sign the December letter to the mayor. Council Member Ferreras-Copeland did sign, though, and she could be heard on the floor of the Council responding to Greenfield and others that the city is 'not that flush' with cash, cautioning her colleagues to be mindful about assuming there is money for everything or an ever-increasing budget. "What was powerful about the PEGs was setting strict targets for agencies to meet and so it generated greater savings," said Maria Doulis, vice president of the Citizens Budget Commission. Agreeing with the intent of the Council members' letter, she said, "It's the responsibility of everyone in government to be constantly questioning whether things are operating as cost effectively as possible." De Blasio is expected to release his preliminary Fiscal Year 2017 budget toward by the mid-January deadline, which will trigger the first round of Council budget hearings, starting with the mayor's budget director appearing before Ferreras-Copeland's finance committee. 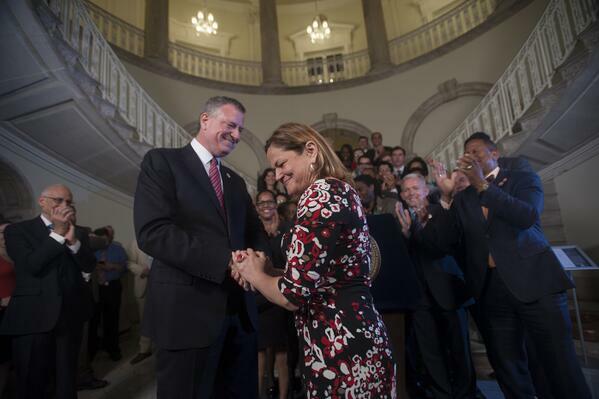 City Council Speaker Melissa Mark-Viverito did not sign the letter, but a spokesperson for the speaker told Gotham Gazette that during preliminary budget hearings the Council will be looking for ways city agencies can find savings. Ferreras-Copeland explained her support for the formal request: "As this letter states, asking agencies to review their budgets is sound policy, and we ask them to conduct these analyses with the goal of finding 5% in savings," she said in a statement to Gotham Gazette. "These efforts will help ensure that our considerations in the Finance Committee are balanced as we develop a budget that reflects the values of efficiency, equity, and fairness for New Yorkers."